Terreal Malaysia Sdn Bhd is one of the leading local manufacturer of clay roof tiles in Malaysia. Our plant in Kluang commenced operation in 1994 utilising the latest state of the art French technology. 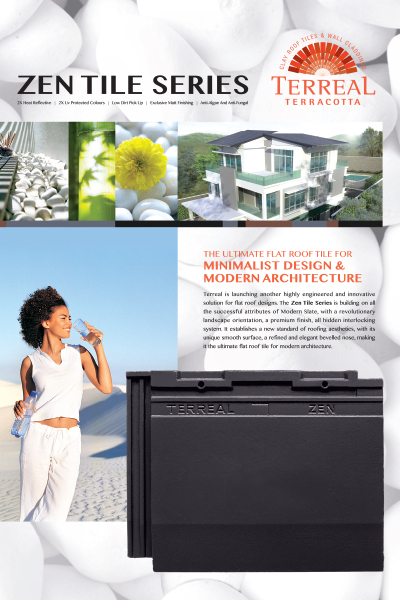 As the worldwide leader in clay roofing tiles, Terreal Malaysia has extended its product range, including thermal reflective insulation, roofing component and solar water heater. “COVERING THE WORLD IN BEAUTY” where Terreal clay tiles bring better and long lasting aesthetics to your roof, offer you a new world of shapes and colors, are more cooling for better comfort and also enhance the value of your property.